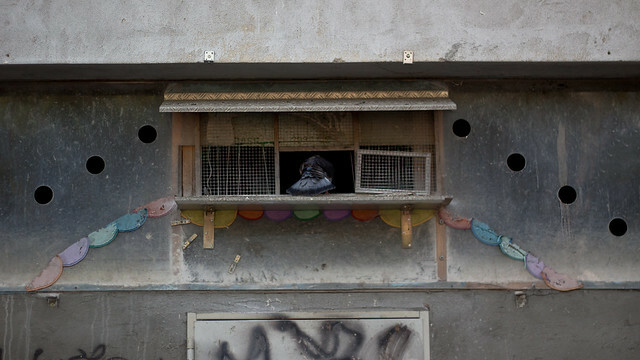 Keeping clean lofts can be one of the most important parts of successful racing pigeons. Often overlooked and time-consuming, good husbandry comes down to cleanliness. For your birds to be in top form, they need to be the picture of health. The added bonus is that while you are keeping those lofts clean, you can keep a good eye on your birds, seeing who is in top form, and when. First and most obvious, clean up that poop! Bird poop is a breeding ground for parasites and bacteria. The lofts should be cleaned daily. This is one of the best ways to keep your birds healthy and in racing form. Moving about the loft while cleaning gets your birds to use to you, this is a good time inspect birds. In addition, cleaning poop out of the lofts daily means you will see if something strange is going on. Does somebody's poop look different than usual? Next, clean those water dishes. Don't just top them off or dump and refill. This is another good place for bacteria and parasites. It is important to rinse them daily, and if you're really strict about cleanliness in your loft you'll wash them with soap and water every day. At a minimum, water dishes should be washed once a week. Remember to thoroughly rinse the dishes after you've had soap in them. Don't just keep refilling those yucky water dishes, clean them. Your bird's form depends upon it. Finally, wash the food dishes! Even though they are dry and don't appear to get dirty as often as water dishes might, they still need regular cleaning. Once weekly is a good rule of thumb for cleaning food dishes. Again you should make sure to wash them completely with soap and water. Allow the dishes to dry thoroughly before you add more food. Good racing pigeons start with good husbandry. Good husbandry starts with cleanliness. Keeping the lofts clean is the most important thing you can do to ensure your birds are in top racing form. Nobody wants to race a sick bird and tax its weak body further. The three most important things you can do to keep your lofts clean is clean up the poop and wash dirty food and water dishes often. The added benefit of daily cleaning is that you get to spend time observing your birds. Observing your birds means you will get to know each individually and learn when they are race ready. How can you be the envy of most fanciers in your circuit? 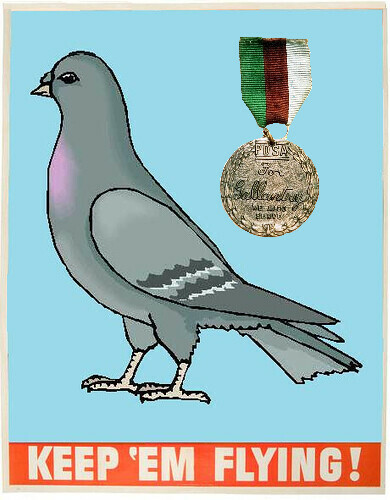 Simple; just care for the best racing pigeons and send them to compete. This is easier said than done, but with the right formula at your disposal then it's easy to take the lead in the circuit. It all starts with selecting the best racing pigeons to breed. There are many schools of thoughts that are propagated right now on how to carefully select the best breed. Though the suggestions are varied, it all boils down to the birds' ability, the feather and its confirmation. In bird selection, you can never go wrong with the ones that have a lineage- racing pigeons that come from that illustrious family of race winners. If you don't know someone that breeds these top quality birds, then the second option for you is to go downtown and check out the lofts that breed these birds. One tip to follow is to ask the assistance of someone who knows a thing or two about these birds so that the right ones can be picked. Once the right racing pigeons have been selected, then you have hurdled one stumbling block in becoming the leading fancier in your community. Now select the best means you are compelled to ensure that they are well-attended to. This means that raising and maintaining these birds and their lofts should be prioritized. There are a number of suggestions on how you can make this happen in your own lofts. And it's best that you are guided by these when raising your birds. • Overcrowding the loft is not the best strategy. According to many fanciers, every pigeon should be allotted with at least 1 ½ square feet of space. This means that the space of the lofts will be dependent on the number of birds. • Supply the birds with the right amount of food. But it doesn't mean that you will have to over-feed these animals. • Take care of the health of the birds by subjecting them to regular checkups. There are certain vaccination shots that should be enjoyed by these birds including shots for pox and paratyphoid. • It may be best if you can worm these birds at least twice a year. • If your budget is more than okay, it is best as well to get vitamins and supplements for the birds. Ask the neighborhood vet for the right vitamins for racing birds. A corollary to this, don't just randomly select vitamins which you think are best but are not. • And did you know that a piece of garlic can do wonders for the health of your birds? There are some fanciers that attest to the workings of garlic. They say that the consumption of this food item helps the rejuvenation of the blood. Care is not just done prior to racing. Right after racing, racing pigeons deserve some care and affection as well. Give them enough time to rest and recuperate- after all, they have been involved in a very rigorous activity!